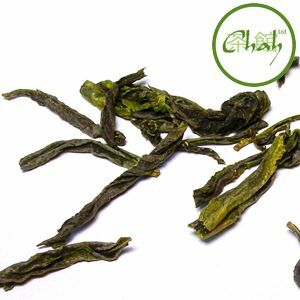 Originally Guan Pian tea was called Gua Zi Pian or “Sunflower Seed” because the leaves were said to resemble sunflower seeds. Over the years, the name has been shortened to Gua Pian causing some to mistakenly refer to this tea as “Melon Seed.” Grown in Liu An County in the Dabie Mountains of China's Western Anhui Province, the tea is harvested in early spring, when the tea growers cut off the end of the tea tree branches and use the second tea leaf- not the bud, as in most teas. Its leaves are long, thin and soft, which produce a light and almost fruity aroma. The taste of this tea is very smooth, with a hint of sweetness. Brew: 2 tsp per cup; near boiling water; 75°C, 3 minutes for first brew and then add 30 seconds for each subsequent infusion.